Well you’ve got me again for the second time in four events. I can only hope I keep finishing third as regularly through the upcoming European and National Championships, unfortunately more likely I will add another digit after the three. While we had been promised flat water and a great sea breeze the locals hadn’t mentioned the one caveat on that. It turns out in an east or south easterly the sea breeze might not develop the same as it does along the rest of the south coast so while Portland basked in sun and 20 knots of breeze in Paignton we got the swell but not the wind to go with it. While several travelling from more sheltered waters had done so in hope of a bit of practice in waves. It’s just not quite the same in no wind. Still the race officer got a start going when the breeze got up a little. However, when the gun went all were low riding. Half way up the first beet the left came good and Dan Ellis foiled into lead almost reminiscent of Jim McMillan’s in my last report and like Jim he found a large hole so everybody could catch back up. The wind had carefully positioned itself on the left hand side of the course leaving the leeward mark a dead calm so everybody foiled down the run then parked at the bottom before foiling back to the windward after a bit of low riding. This pattern repeated itself before the wind dropped off altogether and the race was abandoned. Day two didn’t start any better with a high tide and waves pinning the fleet ashore for a postponement. By launching time, we could see the white caps of the waves from the beach and some were getting nervous that this light wind start to the day could end up too windy. Once out there this proved not to be a problem and while we had better wind then Saturday it wasn’t solid across the course and the pattern of breeze on the Left with none at the leeward mark was repeated again. With a few boats taking some time to get the hang of the waves most didn’t make the start on time and between retirements and a UFD only two boats made it to the finish. In the second however the fleet was back to full strength all the way to the finish with Dan Ellis starting to stamp authority on the event after his earlier starting line transgression. As the races continued the wind was dropping leaving large holes but again as it was all weekend the left hand side of the course was king. After breaking my kicker shortly before the finish of race three I decided to head in. As I approached the beach I began cursing Ricky Tagg as he was already ashore. I had been pinning my hopes on Ricky to take third place off me and with it the duty of writing this report. 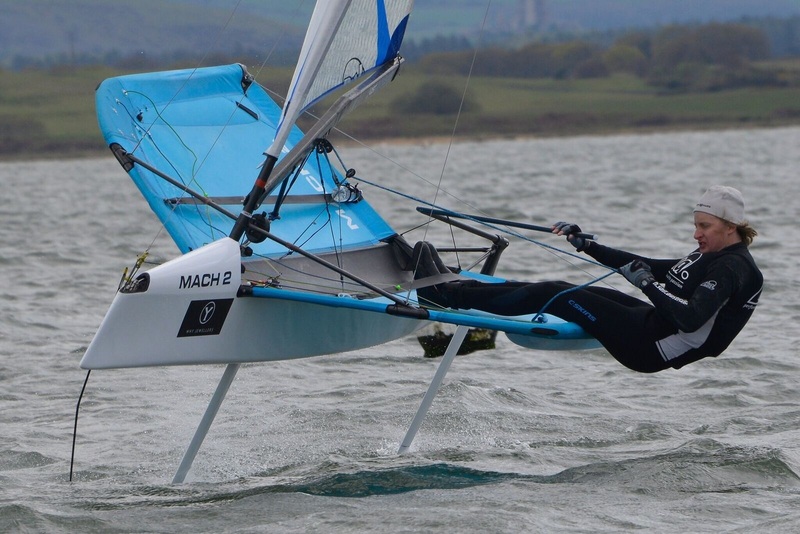 That responsibility was to be passed to James Phare and he almost succeed only being relegated to fourth on count back, thanks to Chris Tilbrook finishing second in the final race after remembering that the wind was on the left and not blasting off right into hole like several others. The fourth Nobel Marine Grand Prix of the year was a great reminder of just how much fun sailing a moth in large swell can be hopefully something we can do again in the near future.